In the second half of the 20th century, in the world of Indian film music and in the kingdom of Playback singing, if we explore the pages of history we come across a number of wizards. In the process of scrolling, our Observation gets stuck at a particular point. At that point we find a name, which became an example of versatility. This legendary personality stands as a symbol of utmost simplicity, generosity, humility & what not. This down to earth individual is non other than that shy child ‘Pheeko’ of a small village Kotla Sultan singh, known to this world in the name of MOHAMMED RAFI fondly addressed as RAFI SAHAB by the entire Hindi film industry. In the “Tree” of renderings of Rafi Sahab where, each state of emotion is a “Branch” & obviously each song is a “Leaf.” Now let me pick up a few tender leaves full of ‘Chlorophyll’ means ‘the evergreen ones’. ‘Hari Om‘ from Baiju bawra starts with a deep internal vibrations of the heart & soul & the stage of complete surrender to the Almighty, stimulates the ‘Brahman’. This has taken the sadhus at Varanasi to the utmost stage of surprise. ‘Sukh ke sab saathi‘( Gopi ) & ‘ Badi der bhai nanda lala‘ ( Khandan ) the bhajans on lord Krishna were rendered with such a degree of devotion that who so ever listens to it starts swaying the head as similar as the waves of the sea. ‘Aasman sey aaya farishta‘ ( Evening in Paris ), touches the romantic chord with an inexpressible feeling. ‘Baharon phool barsao‘ ( Suraj ), ‘Ai nargisey mastanaa‘ ( Aarzoo ), ‘kaun hai jo sapno mein ayaa‘ ( Jhuk gaya aasman ) apparently reduces the chronological age of the listener from 60 to 16. ‘Yeh zindagiki mehfil, mehefil mein hum akele, daaman ko koi choomein, zulphon sey koi kheley‘ ( love in Tokyo ), ‘Tumne pukara aur ham chale aye, dil hatheli par le aayirey‘ ( Raaj Kumar ), ‘Is rang badaltee duniyan mein, insane ki keemat kuch bhi nahin‘ (Raaj kumar ), ‘Yeh aankhen oof yu mma, yeh nigahen oof yu mma‘ ( Jab pyar kisisey hota hai ) a slow but tempting way of pulling the lyrics from within & presenting before the beloved in a most subtle way creates a hypnotic state both for the beloved as well as for the listener. The listener gives a jerk of seduction irrespective of his present state of position. ‘Yahan mein ajnabi hoon, mein jo hoon bas wahi hoon‘ ( Jab jab phool khiley ), ‘Jab bhi ye dil udaas hota hai, jane kaun aas paas hota hai‘ ( Seema ), ‘Jane walon zara , mudke dekho mujhe‘ ( Dosti ). A state of utmost sadness, frustration, fed up with the society and its partial attitude towards the true lovers & seeking for the finer understanding from the fellow human beings has been very aptly rendered by rafi sahab. ‘Chalkaaye jaam, aayiye aap ki aankhon ki naam‘ ( Mere hudum mere dost ), ‘Mujhey duniya walon, sharabi na samjho‘ ( Leader ). Rafi sahab has done full justice to these songs but the strange fact is that he was a teetotaler. Imagining the condition of a drunkard & humming the song as if he himself is fully drunk, simultaneously maintaining the melody to the fullest extent is really a thing to be realized how much effort did rafi sahab made to motivate the hero Dharmendra jee & Yusuf sahab to enact before the camera. ‘Main hoon Mr johny, mainey sab mulkonka piya hai paani‘ ( Mai baap ), ‘Aai dil mushkil hai jeena yahaan‘ ( C.I.D ), ‘Jangal mein, mor nacha kisinena dekha‘ ( Madhumati ), ‘Suno suno miss Chaterjee, mere dil ka matter jee‘ ( Baharein phirbhi aayengi ). This typical style has suited Johny walker to such an extent that while listening we feel as if Johny walker himself is singing and there is no trace of Rafi sahab. The songs became superhit due to its natural sway & melody. Producers created a role for Johny walker & at least one song on him was picturised for which the playback was Rafi sahab invariably. In the movie immediately after the song when we listen to the voice of Johny walker we can’t make out for a while whether Rafi sahab was singing or Johnny Walker himself was singing. I mean we are hypnotized to that extent by Rafi sahab. ‘Yeh duniya agar milbhi jaye to kya hai‘ ( Pyaasa ), ‘Tujhko pukarey mera pyaar‘ ( Neel Kamal ), ‘Patthar Ke Sanam Tujeh‘ ( Patthar ke Sanam ). The heavy rolling of Piano, Violin, Tabla & the slow but painful voice emerging out from some corner, shivers the listener to feel pity for the singer. An apparent feeling of giving solace to the singer arises in the heart of the listener. A true listener looses the control over his blinking eyes. ‘Kar chale, ham fida ( Haqueeqat ), ‘Suno suno, ye duniya walon‘ ( Private ), ‘Awaaz do hum ek hai, hum ek hain ( Private ). Listening to these numbers, uncontrollable patriotic vibrations are generated irrespective of the age. A feeling of unity, love & liberation from the unwanted germinates. Particularly at the higher notes the listener develops a shivering of the heart like a tremor of the earth. ‘Main kab gaata, mere swar mein, pyar kisika, gaata hai ( Private ), ‘Jaag diley diwana, rut jagi, basley yaarki ( Oonche Log ), ‘Janu kya, mera dil, ab kahan khogaya ( Ziddi ). The fine drag of the words, whirling modulation of the syllables & finally merging the notes in the interlude creates a typical state of emotion for the listener. I don’t know how much effort our Rafi sahab used to put to create that emotional effect but to the observer it appears as if Rafi Sahab himself had gone through that stage in his life. This entry was posted on Wednesday, September 19th, 2007 at 8:18 pm	and is filed under Meri Awaaz Suno. You can follow any responses to this entry through the RSS 2.0 feed. You can leave a response, or trackback from your own site. Mohd. 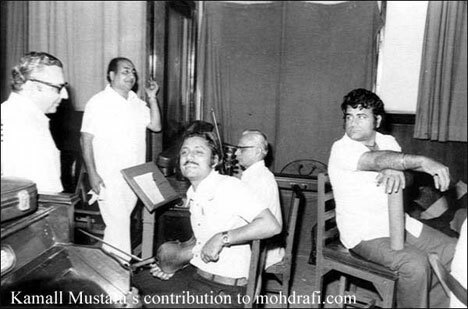 Rafi – the ultimate of MELODY, was specially created by THE ALMIGHTY, will remain un-parallel for another thousands of years to come. this message is for m.rafi family memmbers .i will pay you 100000 us dollars iy you provide me his live concert alumbum.my phone number is 678 895 8340 i need this for my mother. True, Mr. Ramakrishna, one can never be able to describe the phenemenon that is called MOHAMMED RAFI, however much one tries to do it. What I was talking about was the other “moods” or “styles” that Rafi Sahab had adopted to suit the picturisation of the song, the hero, the storyline and the music composition. Anyway, we will have many more articles from you and all the other goods writers in the coming days and that should be able to complement what was left unsaid in your article. dear Ramaswamy sir, Gurumurty sir, a.s. murty garu, mehetab jee, Sri venkatadri garu, ahmed kutty jee & all the readers. I thank you very much for your kind responces. Sorry I could not give a detailed study. It was only in a nutshell. As Mr A.S. Murty has told it has ended abruptly. I am sorry Murty garu it will take pages and pages if I go on describing. I would like to explain this issue in this way please, If I stand near a well I can describe the well completely, If I stand near a pond I can describe it fully, If I stand by the river side I can describe its banks, flow & direction. But if I stand in front of an Ocean then what can I describe ? ? ? I can see only 1 % of the ocean probably & can describe that much only. With all my efforts I did that much only. It is sure there is no replacement for rafisaab and a versatile singer like him will not come again.various catogeries of songs if we check the best will be rafi saabs songs. Best wedding song : aaj meri yadd ki shadi hai from aadmi sadak…. 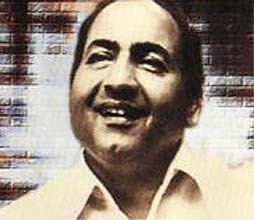 He is the emperor of singers as almost all singers favourite singer is rafi saab. He is not related to a particular state. No other singer in India (male or female) got such love and affection from the fans.His fans are treating him as their own beloved one. Rafi saab did not sing a single song in Malayalam but Keralites are treating him as their own singer.The master piece of stage progrmmes is Oh Duniya ke rakwale. One of his fans in Kerala who is a porter in alleppy is conducting Rafi night every night of 31st July with his hard earned money.Veteran Karnatic Musician and play back singer Yesudasji told once he is the devotee of three prominent people and rafi saab one among them.Mannadeyji told in Indian male singers nobody can replace rafi saab.Mahendra kapoor told when he first met with rafi saab it is his auspicious day in his life.another singer from South india Jayachandran told rafi saab is really a part of god and could not meet him personally is a loss for him.South indian singer Unni Menon told he could not take food on the 31st July 1980 the day of demise of rafi saab. Yet another very nice write-up on Rafi Saab. Please accept my congratulations. Nice Article Mr. Ramakrishna! Thanks. The heights of Rafi the Great can’t be achieved by normal words. The depth of Rafi Sahib can’t be measured by any metre. He is all time great, even if a ‘vindictive stage anchor’ remembers him or not before the audience but the audience, the authentic court for an artist always remember him. Mohd. Rafi Sahib has created numerous gems by his own singing, musical & melodious talent. Everyone wants to have those gems. Mr. Ramakrishna, you have rightly elaborated in your article about this great accentor of India. Was Rafi Sahib only belong to an Indian audience? No, whenever one hears his song for the first time, he/she may however belong to any country, he/she can’t remain untouch from the magic of Rafi Sahib. No book/comment can fully justify his heights and depths. One can only try to reach near his musical & melodious shades. The platform, relating to Rafi Sahib, has the power to make bridge among various countries. May the whole World unite in the name of Rafi Sahib! Fantastic compilation Mr. Ramakrishna. In fact I found it ended sooner than expected and you should have gone on and on on other styles and moods that this great epitome of a singer has presented during his life time. Sure it is very difficult to present the full picture of the multi-talented personality in the form of an article, (volumes of books also may not be enough), but there are several other types of moods that Mohd. Rafi Sahab had expounded. I still feel the article is incomplete and that you may come up with a sequel to it. Any way, very interesting and absorbing reading. Kudos. Nice article Ramakrishnaji. Under each category, there are umpteen number of beautiful songs sung by Rafi Saab, but of course due to space constraint we cannot list them down. Excellent article but I think due to lack of space or want of time you must have omitted say qawwali, fast, shayari and some ghazal numbers. Excuse me, if I have mistaken. Since you are writing so many articles, I hope you must have reserved these for the coming articles from your end. Keep it up. I have copied this article in my word documents. Such articles and all others written by our Rafisahab fans should find some space in our local newspapers and periodicals regularly, so as to educate the current & future generations who blindly follow the irritating sounds given by that topiwala “Himesh Reshammiya” & others.